Urutaa is a Maori word meaning “pestilence” and “plague” and “fever”. It is also a sound that evokes “METAL!”. So I will call the whole army Urutaa. Because they kill you FILTHY! I bought heavily into the new editon 40k and especially the Death Guard when they were released. 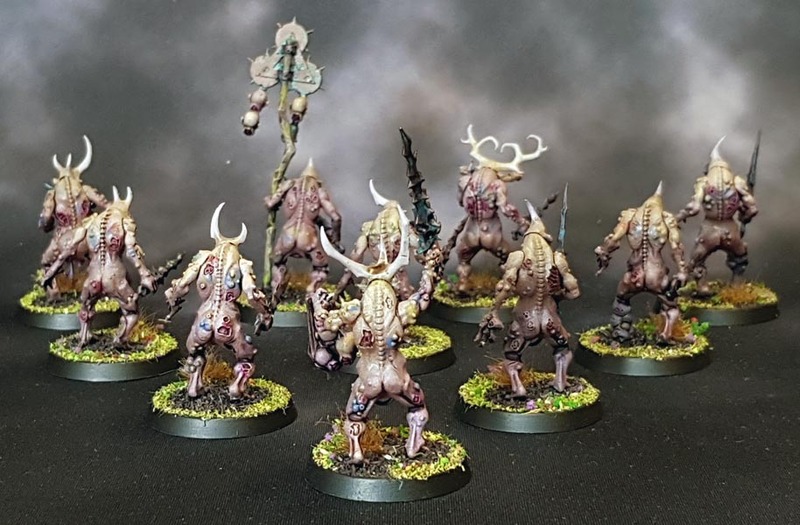 At the same time I also bought some Daemons of Nurgle (Starting with the Blightwar set) as I always have been more partial to Nurgle than the other chaos gods and these would be a good fit both for the Death Guard and for my budding Maggotkin army for Age of Sigmar. Or so the self-justification for spending all that money on some rather expensive plastic went. And, as usual, I am getting round to them late. 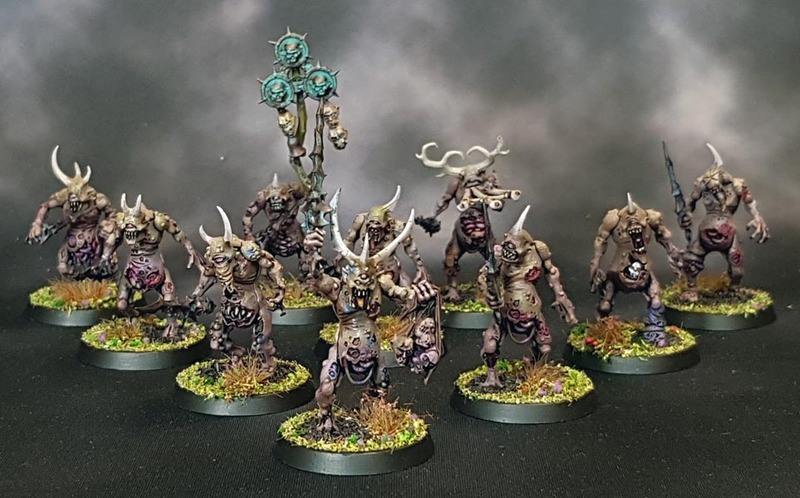 I begin with these Plaguebearers to establish the esthetic I would like to have across the army. I started with a grey undercoat, and further undercoated by spray in an orangy leather brown from below and a sandy yellow brown from above. On top of this I painted assorted details in a lot of different colours, mostly purples and reds with a dash of green here and there. Light grey for the horns, dark brown for the claws. Pink for eyes. The weapons were basecoated in Scalecolour Caribbean Blue (a bright turquoise that is more or less the same as citadel nihilakh oxide) and drybrushed heavily with Vallejo Tinny Tin (a dark bronze like the old Citadel Tin Bitz). When I had had enough of dotting in bits and slopping on slashes of colour here and there I gave each mini including the weapons a heavy wash of Citadel Druuchi Violet Wash followed immediately when still wet with a moderate to heavy wash of just the head and upper body with Citadel Athonian Camoshade Wash (which is a greenish brown or a brownish green). This has the effect of clearing off much of the violet leaving the filthy green, and also mixing with the violet at the edges, creating a nice gradual colour transition effect. I take care to avoid the washes pooling by drawing off most of the pools with a damp brush. Also, the violet interacts with the sandy and orangy brown beneath, creating a rather splendig purple tone. It really is much more easy to do than it looks! When the washes are dry, I go over some of the details such as eyes and teeth, and add some more colour here and there. On the bases, I first glued down some black flock around the feet, and when dry I added a few appropriately dead-looking tufts and my normal flockmix. The effect is to illustrate how they pollute the ground they are walking on. but is still quite quick and easy, and also looks much better. Lovely work here once again. I’ve added Scalecolour Caribbean Blue to my “to buy” list as well. 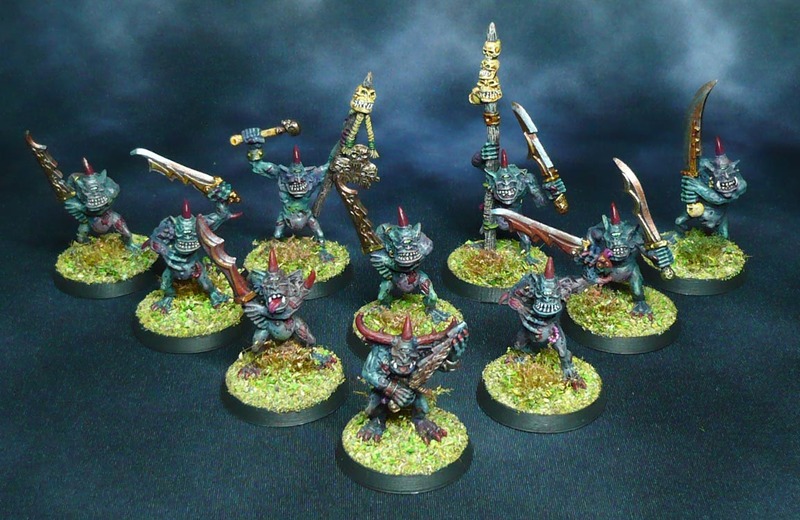 I really need to get back to my Nurgle Daemons!